Eoin Young's recommended -"must read" book! Every year or so there is a motor racing book that appears on the scene and completely eclipses anything that has been in print for the previous several years. My problem is that it took me several years to realise that this book existed! Nigel Roebuck had told me about his luxury in being offered the chance to write a book with the only constraints being that his stories had to happen during the life of formula 1 from 1950 forwards. Such an offer to a motor racing writer so steeped in the history and the meaning of formula 1 was pretty much like winning the lottery. A wonderful indulgence. Alan Henry, Maurice Hamilton, Roebuck, Jenks and I used to travel together to all the formula 1 races in the Good Old Days and now Nigel was given rein to write about all the races and people we used to talk about after endless dinners. If someone recounted a tale that drew applause over the cognacs and coffees - well, maybe not all of us drank coffee - we would joke that wasn't it a pity that whomever had told the tale, couldn't write as well as he spoke. Roebuck can! and does. 'It was around two in the morning, and not another soul was to be seen. "Same sort of night as 1961, lad! Moonlight and schnapps"
"Was then, too, but I managed all right." "Well, you know, you're a bit older now, and..."
It wasn't working. Resolutely, Innes set about finding footholds and began to climb. What to do? I invented a policeman, said he was coming this way. The mountaineer growled a very rude word, and continued to ascend"
That was motor racing when drivers were characters rather than precious millionaire sportsmen. Roebuck captured the scene perfectly. Then there was the V16 BRM, a Grand Prix project beloved in memory, but devoid of substance in reality. Roebuck: 'As a child I was given an EP record of the V16 on full noise, and once mentioned it to Stirling Moss. "I'm surprised," he said, "that it ran long enough to fill an EP." It was a fair point. 'The reverence in which this first BRM is held by some has always been a source of mystery to me, for it was surely one of the silliest racing cars ever conceived. It may have had huge power -ultimately perhaps as much as 600 bhp at 12,000 rpm - but it never gave it for very long, and when it did, delivered it in such a way as to make the car virtually undriveable." Stirling Moss said "The V16 was a thoroughly nasty car. The brakes were OK and the acceleration was incredible - until you broke traction - but everything else I hated, particularly the steering and the driving position. Handling? I don't remember it having any. Some, though, were always dewy-eyed about it, and none more than (Raymond) Mays: 'The V16 was an awe-inspiring car to drive. You could re-spin the wheels at 9,800 rpm in fourth gear, you know ' It never seemed to cross his mind that a driver didn't actually want a car which could do that." Roebuck captured the moment when the V16 BRM failed on the line with none other than the French champion, Raymond Sommer at the wheel. 'There it sat, transmission broken, bellowing in impotent rage as Sommer vainly stirred the gear lever around, hoping that some drive could be found somewhere'. Later in this trip down memory lane, Roebuck visits the H16 BRM, murmuring 'One might have thought that memories of the V16 would have persuaded BRM that maybe 16 cylinders were a few too many, but no, here was another doom-laden project along similar lines: too heavy, too complex, too unreliable.' Tony Brooks is the driver that Stirling Moss has always said he would sign for his dream team if ever he had been asked to form one in the late 1950s and Tony has often come over to long reminiscing lunches at the Barley Mow, my "local" in the Surrey village of West Horsley. Roebuck as always enjoyed a special relationship with Rob Walker despite the difference in their ages. Both live for their involvement in racing. Roebuck: 'Easily forgotten is that the first Grand Prix victory for both Cooper and Lotus was scored not by the works cars, but by the private entry of the RRC Walker Racing Team. And each time the driver was Stirling Moss.' I cannot recommend this book too highly. The thing that totally amazes me is that it was published in 1999 and I have only just discovered it! The book is out of print now but I can offer a copy in excellent dustwrapper signed by Nigel Roebuck for £35 plus p&p. A Word About Signed Books and Memorabilia. A book that is signed by the author or someone significant to the content, immediately becomes unique and therefore more valuable than if the title page remained unsigned and unsullied. I rate good signatures highly and I stand by all the signed items I offer on this website catalogue, but in the big world outside it is very much a matter of caveat emptor - let the buyer beware. Be extra wary of recent driver autographs unless you are certain of the provenance. The only way you can really guarantee that a modern driver's signature is authentic is to have him perform the act in front of you. This will confirm that it was indeed his signature, but you will almost certainly be disappointed at the wiggly line that purports to be an autograph. If you do not see him sign, the chances are that the signature (sorry, the squiggle) could have been performed by a secretary in the confines of the team motorhome. In what I consider to be the "Good Old Days" of the 1960s, a driver's signature was a work of art, something instantly recognisable and a mirror of the man. Thus Graham Hill's signature was done with a swashbuckling flourish (see Catalogue #449) and Jim Clark's signature was almost that of a shy schoolboy, both of which fitted the men with the pen. Jackie Stewart's original signature was probably much like Jim's, but he felt that if someone granted him the honour of asking for his autograph, it should be worthwhile, and he practised his copperplate autograph. No disinterested squiggle, looking away, talking to someone else, here. You could glance at an item with a number of signatures of drivers in the 1950s or 1960s and immediately identify most, if not all. Try doing that today. Probably easier to identify the modern grid-full by their fingerprints. Autographs tend to depend on the fame of the person concerned. Nigel Mansell was undoubtedly famous, but it was only a year or two ago that Chaters were offering signed copies of his autobiography at remainder prices! When Enzo Ferrari died, Mario Acquati, who runs the wonderful bookshop at Monza (Is it still standing? Rumour had it that my favourite bookshop was being demolished to make way for more motorhomes in the paddock.) told me that there were books and items signed by Enzo coming out of the woodwork, offered for sale. I told them all that I couldn't buy them because there were so many fake signatures about. So what happened? They dropped the ridiculous prices they were asking, and I bought a lot of them. Enzo Ferrari's classic signature is a case in point. He always signed in a distinctive violet ink, said to have originated from his early days when he wrote with an Italian lead pencil that, when licked, became violet in colour and indelible. Italian journalist, Pino Allievi, can still do a perfect Enzo Ferrari signature, which is both amusing and a vague worry in case his artform gets into the wrong hands. You can date Ferrari signatures because as he got older, his hand became less firm and the signature in recent years was very shaky. I have a favourite photograph, framed in my collection. It was taken after a Ferrari press conference when I had asked Enzo to sign a mint copy of his autobiography in English, 'My Terrible Joys'. Someone took a photograph of me standing behind him, watching over his shoulder as he signed the book - so I sent the photograph to his personal assistant, Franco Gozzi, who arranged for Mr Ferrari to sign the photograph of him signing my book. And it's certainly not for sale! 14. IT STILL BEATS WORKING! Eoin Young is a New Zealander who left a bank job to join Bruce McLaren and help set up his racing team. More or less. He arrived in the UK in 1961 as a freelance journalist, covered the Formula Junior season with Denny Hulme, joined McLaren in 1962. Founder director of team. Established Motormedia 1966. Started weekly "Autocar" diary page in 1967 -- it ran until 1998. Covered CanAm, Indy and GP series. 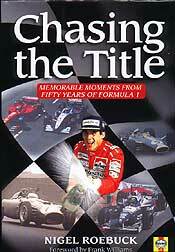 In 1979 established as a dealer in rare motoring and motor racing books and ephemera. Still trading with regular lists. Autobiography "It Beats Working" published in 1996. with its sequel "It Still beats Working" in 2003. He lives in tiny low-beam period cottage in Bookham, Surrey. Drives VW Golf VR6. The stock of Motor racing books and ephemera is constantly changing. Click here to view the current catalogue.